Low levels of the "sunshine" vitamin D appear to increase a child's risk of anemia, according to new research led by investigators at the Johns Hopkins Children's Center (https://www.hopkinschildrens.org/index.aspx). The study, published online Oct. 10 in the Journal of Pediatrics, is believed to be the first one to extensively explore the link between the two conditions in children. The researchers caution that their results are not proof of cause and effect, but rather evidence of a complex interplay between low vitamin D levels and hemoglobin, the oxygen-binding protein in red blood cells. The investigators say several mechanisms could account for the link between vitamin D and anemia, including vitamin D's effects on red blood cell production in the bone marrow, as well as its ability to regulate immune inflammation, a known catalyst of anemia. To capture the interaction between the two conditions, researchers studied blood samples from more than 10,400 children, tracking levels of vitamin D and hemoglobin. Vitamin D levels were consistently lower in children with low hemoglobin levels compared with their non-anemic counterparts, the researchers found. The sharpest spike in anemia risk occurred with mild vitamin D deficiency, defined as vitamin D levels below 30 nanograms per milliliter (ng/ml). Children with levels below 30 ng/ml had nearly twice the anemia risk of those with normal vitamin D levels. 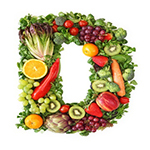 Severe vitamin D deficiency is defined as vitamin D levels at or below 20 ng/ml. Both mild and severe deficiency requires treatment with supplements. When investigators looked at anemia and vitamin D by race, an interesting difference emerged. Black children had higher rates of anemia compared with white children (14 percent vs. 2 percent) and considerably lower vitamin D levels overall, but their anemia risk didn't rise until their vitamin D levels dropped far lower than those of white children. The racial difference in vitamin D levels and anemia suggests that current therapeutic targets for preventing or treating these conditions may warrant a further look, the researchers say. "The clear racial variance we saw in our study should serve as a reminder that what we may consider a pathologically low level in some may be perfectly adequate in others, which raises some interesting questions about our current one-size-fits-all approach to treatment and supplementation," says lead investigator Meredith Atkinson, M.D., M.H.S. (www.hopkinschildrens.org/Meredith-Atkinson-MD.aspx), a pediatric kidney specialist at the Johns Hopkins Children's Center. Untreated, chronic anemia and vitamin D deficiency can have wide-ranging health consequences, including organ damage, skeletal deformities and frequent fractures, and lead to premature osteoporosis in later life. Long known for its role in bone development, vitamin D has recently been implicated in a wide range of disorders. Emerging evidence suggests that low vitamin D levels may play a role in the development of certain cancers and heart disease and lead to suppressed immunity, the researchers note. Anemia, which occurs when the body doesn't have enough oxygen-carrying red blood cells, is believed to affect one in five children at some point in their lives, experts say. Several large-scale studies have found severe vitamin D deficiency in about a tenth of U.S. children, while nearly 70 percent have suboptimal levels. "If our findings are confirmed through further research, low vitamin D levels may turn out to be a readily modifiable risk factor for anemia that we can easily tackle with supplements," says senior study investigator Jeffrey Fadrowski, M.D., M.H.S. (https://www.hopkinschildrens.org/jeffrey-fadrowski-md.aspx), also a pediatric kidney specialist at Johns Hopkins. The research was funded by the National Institute of Diabetes, Digestive and Kidney Diseases under grant number K23 DK084116. Other investigators involved in the research included Michal Melamed, M.D., M.H.S., of the Albert Einstein College of Medicine in Bronx, New York; Juhi Kumar, M.D., M.P.H., of Weill Cornell Medical College; Cindy Roy, Ph.D., and Edgar Miller III, M.D., Ph.D., of Johns Hopkins; and Susan Firth, M.D., Ph.D., of The Children's Hospital of Philadelphia.